Be a farmer for a week and experience summer life on a real working farm. 2019 will be our twenty second year of summer camp and it will be a great one! 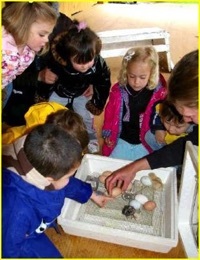 ~Our Kinder Kamp group is specially designed for tots and early school-aged children. We maintain a 6:1 camper to counselor ratio with this group. This active hands-on program will surely delight your youngsters as they experience and learn about the animals and plants of the farm. Crafts, snacks, music, and lots of fun will be had by all. Classes are small, so register early! Ages: 3 up to 6 years. School Aged Children (5 to 14 years old) may register for 1/2 day morning (9:00a.m. -12:00 noon), 1/2 day afternoon (1:00 p.m. - 4:00 p.m.), or full day sessions (9:00a.m. - 4:00 p.m.). With a different theme each day, campers are busy learning about animals, plants and nature, history, science, crafts and food. Each week includes fun and games of all kinds, special guests, and creative endeavors. Our campers are assured of a wonderful and entertaining summer experience in a very unique environment. 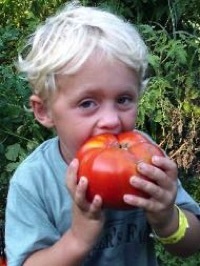 Eight weeks are available this year and every camper gets a special farm tee shirt. Snacks are provided morning and afternoon. Full day campers must bring their own lunch. ~Our Explorer group follows children 7-11 through the rest of their elementary years. Due to the many requests from campers and parents we have extended the age of older campers to accommodate the 12-14 year old group. These Senior Campers will assist counselors, have more responsible farm chores, extended craft projects and will be encouraged to participate in creative independent and group presentations. AM and PM sessions, See below for prices. A.M half day- 9:00 a.m.-12:00 p.m. P.M. half day- 1:00 p.m.-4:00 p.m.
Full Day camp- 9:00 a.m.- 4:00p.m. Registration begins Feb 1st. Refunds: A ten percent fee will be deducted from all cancelled sessions to cover administration costs. No refunds will be given to cancellations made less than one week in advance.